Peter from Double Helix Cables has made a guest post on Gizmodo showing his work to tear down Apple's new Lightning to 30-pin Adapter that began shipping earlier this week. Apple has come under a fair amount of criticism for charging $29 for the basic adapter and $39 for one with a short cable, but Peter notes that based on the electronics inside and the durability of the adapter, the company may have good reason for its pricing. Apple's Lightning connector uses a controller chip to dynamically assign functionalities to the eight pins found in the connector, enabling it to adapt to different situations. The Lightning to 30-pin Adapter is no exception, containing several chips required to allow that flexible functionality to be passed through to devices using the old dock connector design. The chips look unfamiliar, but with the same metal finish and some have lasered text. They all appear to be custom and trying to figure out what does what is fruitless. I really took this apart for the DIY community to ascertain if the DAC [digital-to-analog converter] in this thing is actually good, but it's quite unclear. It's probably some integrated audio circuitry in a larger processing chip, that's how these things tend to be done now. One of the chips reads Apple on it with a very long serial number. Another reads 8533 23AP CAB. Peter notes that underneath the plastic shell of the adapter is a significant amount of metal and glue holding the device together and providing strength and durability. The construction makes the adapter extremely difficult to crack open and does not bode well for those seeking to modify the adapter to add functionality. I really had high hopes that I could get into this thing and attach an audio output cable, but I should have known better. This thing is even more fearsomely reinforced than the Lightning USB cord, by a factor of 10, surely to thwart those that want to hack it, and also so that it cannot break easily. Nobody should balk at paying $29 for this after they see what is inside, though. Despite the complexity of the adapter evidenced its $29 price tag, integrated electronics, and sturdy construction, the device has also been receiving criticism for incompatibility with a number of accessories. 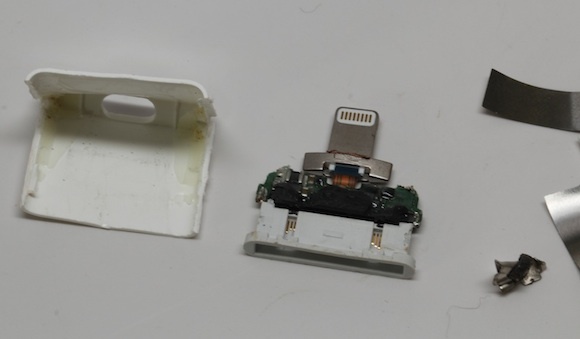 Users have been reporting mixed results in using the adapter with their 30-pin accessories, and users hoping to plug in the adapter with a case on their iPhone 5 may find that the adapter's bulk prevents it from working with all but the thinnest cases or cases with nearly fully open bottom edges. As a result users with cases on their iPhones may prefer to opt for the more expensive cable-equipped adapter that uses a standard-sized Lightning connector assembly rather than embedding the connector directly into the bulky adapter. "Nobody should balk at paying $29 for this after they see what is inside, though." What has the Lightening port done for the consumer? They made a better device that simply would not have been possible with the 30-pin connector. Quit your whining. There are other options for people like you. Now I'm no expert, but this looks like infringement of trade dress to me. Yeah, because when Apple designs a connector, they're planning to "thwart those who want to hack it"
What a completely ignorant statement, made by someone who obviously thinks the world revolves around cables, or revolves around people who care about "hacking" connectors. Also if he cared about how good the DAC was he could have just run sine waves through it and directly measured THD or whatever. Apple has a history of making proprietary connectors and devices with the intention of being able to control 3rd party market. The Original dock connector was an example of this. once the 3rd party market had no problem replicating it in full, Apple went as far as to add DRM to video output blocking all non apple certified dock cables from using video output, preventing the use of 3rd party video devices from using the video source of the iphone / ipod. Apple has also in many cases used software updates to block and prevent furhter modifications of their devices, such as updates to itunes and iOS to block and prevent jailbreaking of devices. I firmly believe that Apple absolutely takes into account how "hackable" their products might be and puts their best efforts into designing around prevention. Apple has always been about controlling their ecosystem. Made the device smaller and lighter, added a possibility of future inputs/outputs and quicker charging. The cable replaces drivers by having specific pins that the acc. makers talk over. But I guess its just easier to throw out the 'Apple is greedy' meme and light up another bowl. Until APple demonstrates that Lightning provides any benefit to the consumer, the criticism is justified. Upgrading from an iPhone 4 to 5 would cost me something like $100-150 in connectors and cables (car charger, adapter, extra cable for the office, etc.) on top of the phone cost. For that additional cost I expect something other than having the headphone jack on the bottom. Thinner? Who cares? The iPhone 4 was a nearly perfect size. If they'd left the 5 at the same thickness, they could have included more battery life. Symmetrical? Again, who cares? Was this really an issue for anybody? Functionality? Right now it's a negative. Where's the HDMI output for Lightning? Supposedly it will be possible, but it's not there now, unlike the 30-pin connector. Maybe this will all be different in another year. Maybe Lightning will provide all sorts of tangible benefits and additional functionality. But right now it's an extra cost that obsoletes old accessories and decreases functionality. So yes, criticism is justified. Well there are a few consumer benefits of the lightning connector. 1) Easier to connect (can't be upside down). 3) Allows the headphone jack to move to the bottom (where it belongs). Really, its the kind of refinement and planned obsolescence that I've come to expect from Apple. Remember the floppy drive, ADB or SCSI ports. These are benefits of a smaller connector, not specifically the Lightning connector. Apple could have used micro USB and every consumer would be better off. I'm fine with that adapter being $29, the issue that I have is this adapter plus 8 inches of wire is $10 more. If you believe Apple 100%. And if you believe they created the best solution vs the most profitable solution (which may or may not be the best). Can you say with certainty - that Apple's solution is the only one that would have/could have worked with the new iPhone 5? I'm sure you think you can. I'm also cure the other person wasn't whining. But I'm so pleased you resorted to the childish response of "there are other options for people like you"